MATSYA AVATAR (FISH)- Lord Vishnu - Saves the life of Sage Manu from floods and recovers the Vedas from demons. Matsya (Sanskrit: मत्स्य, literally “Fish”) is the avatar of the Hindu god Vishnu in the form of a fish. Often listed as the first avatar in the lists of the ten primary avatars of Vishnu, Matsya is described to have rescued the first man, Manu, from a great deluge. Matsya may be depicted as a giant fish, or anthropomorphically with a human torso connected to the rear half of a fish. Matsya forewarns Manu about an impending catastrophic flood and orders him to collect all the grains of the world in a boat; in some forms of the story, all living creatures are also to be preserved in the boat. When the flood destroys the world, Manu – in some versions accompanied by the seven great sages – survives by boarding the ark, which Matsya pulls to safety. 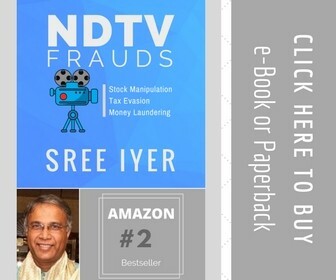 In later versions of this story, the sacred texts Vedas are hidden by a demon, whom Matsya slays: Manu is rescued and the scriptures are recovered. The tale is in the tradition of the family of flood myths, common across cultures. 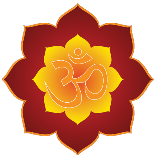 Manu is introduced as Vaivasvata Manu – Vaivasvata being a patronymic – the son of the sun god Vivasvan and a powerful rishi (sage) equal to Brahma in glory. While Manu is performing religious rituals on the banks of the Chervi, he finds the fish. The legend moves in the same vein with minor modifications in that the fish grows in size, gets transferred from an earthen pot to a tank or lake and then to the mighty Ganges River (called the spouse of the Ocean) and finally to the sea. When Manu left the fish in the sea, it warned of impending danger of a catastrophic flood event, which would submerge the whole universe. The fish advised Manu to be prepared to face the catastrophe by building a massive boat to save himself and the Saptarishi (the seven great sages) and collect all seeds of the world and promised to appear when called by him as a huge horned fish to save them. As in the Shatapatha Brahmana, the horned fish appeared and the boat was tied to his horn. The fish navigated it with great force through the turbulent and salty waters of the ocean and reached the safe heights of the Himalayas. As directed by the fish, the vessel was tied to the peak of the Himalayas, which became known as the Naubandhana (the harbour). Matsya tells the sages that he is Prajapati Brahma, the lord of all beings and their saviour who rescued them from danger in the form of a fish. The fish informed that Manu would create all beings – gods, demons and men and other movable and immovable things – by the power of his austerities. The fish vanished and Manu acted on the advise of Brahma, creating all beings. The Matsya Purana initiates the Purana scripture tradition of identifying the fish (Matsya) with Vishnu instead of Brahma. The Purana derives its name from Matsya. It starts with the legend of Manu. King Manu renounced the world, handing his throne to his son and set off to the Malaya Mountains to perform tapas (austerities). Pleased with the austerities, Brahma granted his wish to rescue the world at the time of pralaya (dissolution of the universe). Like in the other accounts, Manu meets the tiny fish. The fish is placed in a jar, in a reservoir that is two yojanas in height, and eventually ends up in the ocean. Astonished by the fish’s growth, Manu realizes that the fish is the god Vishnu. Vishnu as Matsya reveals his real identity and informs Manu that a pralaya would soon come as a yuga (epoch) and a kalpa (aeon equal to Brahma’s day) would soon end. Brahma sleeps in his night and his creation dissolves, submerging the earth and all the other worlds in the cosmos in the primeval ocean. Vishnu promises to return to rescue Manu at the time of pralaya and orders him to bring all living creatures and seeds of all trees on a boat, which the gods would gift him. As pralaya came, Matsya came and pulled the boat with the serpent Shesha as the rope, fastened to his horn. At the end of a kalpa, a danava (demon) called Hayagriva (“horse-faced”) steals the sacred Veda texts when they come out of Brahma’s mouth when he yawns at the start of his night, fatigued by the creation of the universe. Meanwhile, Satyavrata (also known as Vaivasvata Manu), who was the current Manu (there are multiple Manus in Puranic texts), and the king of Dravida country (South India), was performing severe austerities, sustaining only on water. Once when he was offering water oblation in the Kritamala River, a tiny shaphari fish was caught in his folded hands. As the king was about to throw away the fish, the fish pleaded to be not thrown in the water, where larger fishes would devour it. Assuring the fish protection, the king put it in a small jar and took it with him. But the fish grew larger and requested for more space, the king moved it in a small pond, but the fish soon outgrew it. As the fish outgrew water reservoirs, Satyavrata transferred it to a lake, then to larger reservoirs and subsequently to the ocean. But the fish requested Satyavrata that it was afraid of the dangerous marine predators of the ocean. Bewildered by these words, the king asked the fish to reveal his true identity, but soon deduced that this supernatural fish was none other than Vishnu and surrendered to him. Matsya-Vishnu declared that a great flood would come seven days from then and engulf the universe. He ordered Satyavrata to assemble the seven great sages and with their counsel, gather all kinds of seeds, herbs and various beings to load them on a boat, that would be sent by Vishnu on the fateful day. He instructed that the serpent Vasuki should be used as a rope to tie the boat to his fish-horn. 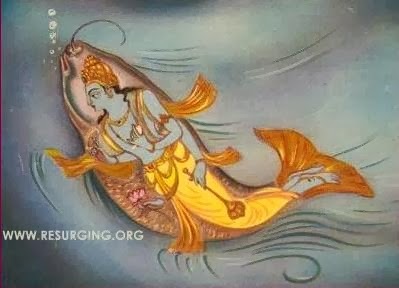 Promising that he would sail the boat through the waters throughout the night of Brahma, Matsya disappeared after his revelation and reappeared as a horned fish on the day of the Deluge, when torrential rains drenched the earth. Satyavrata did as Vishnu instructed and fastened the boat to the horned fish (Matsya). As Matsya swam through the flood waters, he discoursed the king on various topics and revealed to him knowledge of the Vedas, Puranas, Samhitas as well as the Supreme Truth. After last wave of the flood ended, Matsya slew Hayagriva and rescued the Vedas and handed them over to Brahma, who woke after his night. The narrative ends with the narrator Sage Shuka praying to Matsya and declaring that whoever listens to this tale is absolved of sin and remembering Matsya daily grants success to the devotee. During the current kalpa (day of Brahma), Matsya appeared during the first manvantara (Svayambhuva) about 2 billion years ago and then again at the end of the sixth manvanatara (Caksusa) several hundred thousand years ago. We are currently in the seventh manvantara (Vaivasvata). In both cases he appeared at the time of a devastation - the first time after a night of Brahma (kalpa) and the second after a manvantara. His mission in the first case was to protect the Vedic mantras (from the demon Hayagriva) and to restore them to Lord Brahma for dissemination throughout the universe. More widely known is, however, His other pastime in appointing King Satyavrata to protect the seeds of all creatures on a boat from the flood to allow recreation in the next age. Therefore, it was Sri Matsya who facilitated the subsequent creation at the end of each devastation. In fact, Sri Rupa Gosvami mentions in his Laghu-bhagavatmrta 1.3 that Sri Matsya appears at the end of every manvantara for a similar mission. One of the 18 Maha Puranas ( Primary ) is the Matsya Purana. Soon after the cosmic creation, the entire universe was inundated with water. 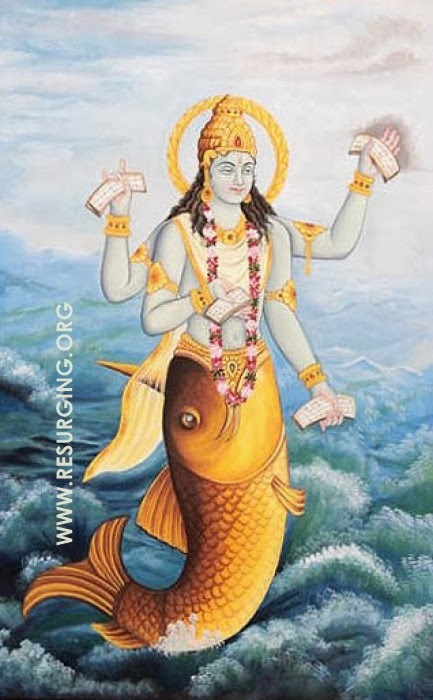 At that time Lord Krsna (Kesava) incarnated as a gigantic fish to protect the Vedas. Therefore Manu addresses Lord Matsya as mukhyatama, the lila incarnation to appear. Fish are generally considered a mixture of the modes of ignorance and passion, but we must understand that every incarnation of the Supreme Personality of Godhead is completely transcendental. There is never any deterioration of the Supreme Lord’s original transcendental quality. Therefore the word sattväya is used here, meaning pure goodness on the transcendental platform.